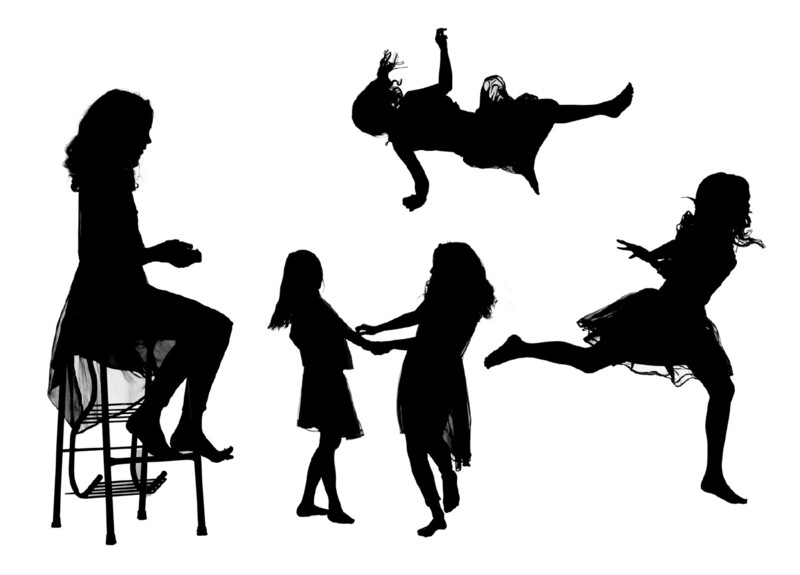 I recently had a studio session with my daughters and one of their friends to create some new silhouettes for future artworks, and thought I share the process with you. As I mentioned earlier, my works are completely photographic, and made up of many layers, which means photographing every element individually. The figures are the most fun. The kids love the chance to leap around and ham it up in from the camera, while I beg them to stay within the realms of the backdrop, or yell ‘Argh, I just cut off your foot!’ when I miss-frame an airborne child. The studio set up is thus: white backdrop, kept as (ahem) wrinkle free as possible to avoid shadows that can make it harder to isolate the figure later. I light the backdrop with one or two studio flash units, and hook up the camera with either a long lead or slave. The slave is simply a wireless trigger for the flash units. The subject is then given strict direction on where they need to be when the camera is fired – in front of the lights, so no light falls on them (unlit subject + brightly lit background = silhouette! ), but still on the white sheet, and between ‘here’ and ‘here’ to keep the backdrop behind them. We usually begin with some ‘crazy’ shots to get them settled into being photographed, then I direct the images I know I need. I shoot a lot of frames, and also leave a lot to chance. The surprises are often the most exciting. One of the characters I needed for a future image is the Baba Yaga, witch of the forest. Here’s my eldest daughter Mari with my cardigan over her head. I don’t know how much longer I’ll be allowed to dress her up, but I’m enjoying it while I can. Note the lit background and (almost) totally unlit figure. I import the image into Photoshop, select the figure and tidy up the outline with the ‘refine edge’ tool. I then create a new black layer and use the selection to copy and paste the silhouette into a new image file. Sometimes, if I want to keep a little bit of tonal detail, like light glowing through a dress or a glint of golden hair, I’ll select the image and darken most of it down to black, keeping the details I need. 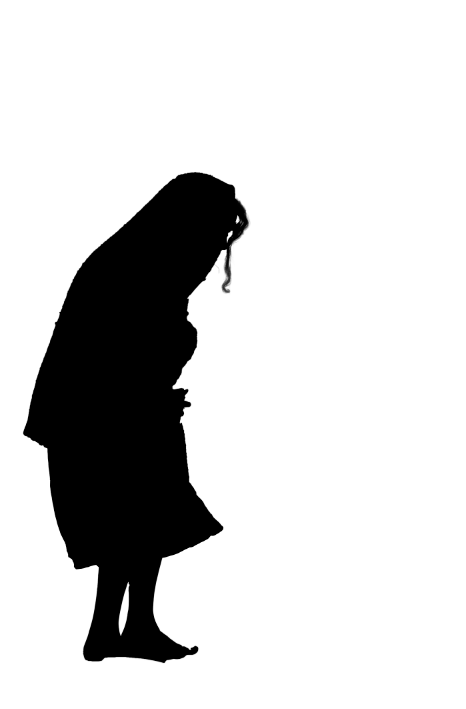 In this case, the Baba Yaga is all silhouette. Then begins the search for a background. I have a stockpile of background images that I shoot whenever we go on holiday, or out for a walk with the camera. Or, often just around the back yard. Most are close-ups with a shallow depth of field. This gives me a few details, but leaves most of the image as a soft backdrop for the detailed silhouettes I lay over the top. 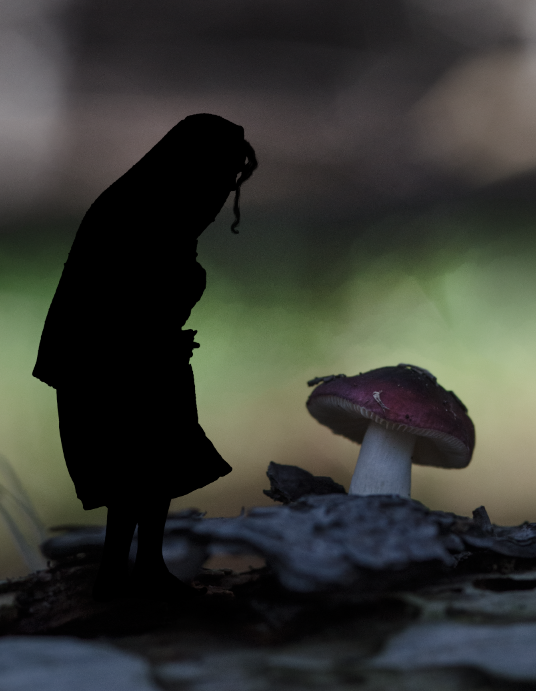 The image below is not a final artwork, but a test for how the silhouette works over a background. I often make small sample images to gather elements before compiling a final piece. Fantastic Lorena, thank you for sharing some of your magic! Thanks Suzette! It was fun to put the process into words.